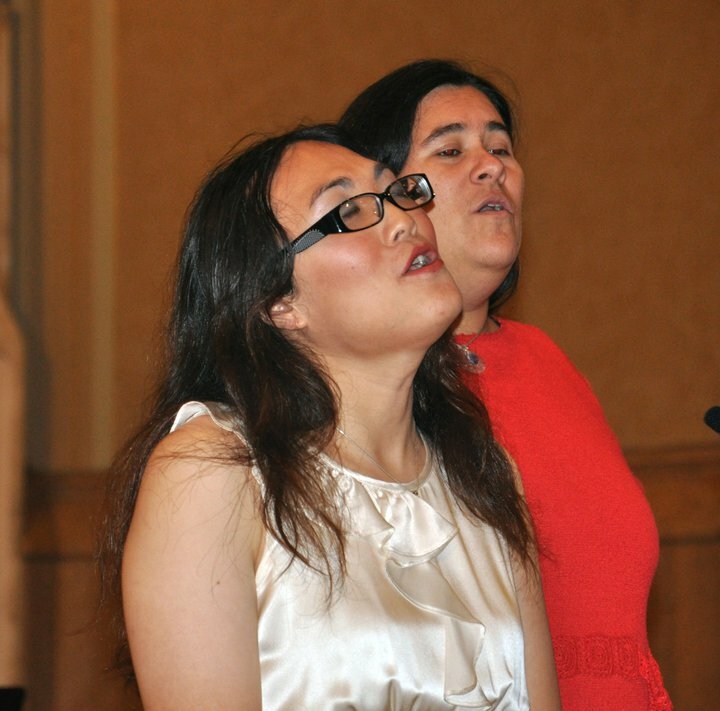 Voices of Harmony normally hosts a season finale performance each spring. Check the Announcements Page, or subscribe to hear when they are announced. We also love to perform at community events, farmers markets, homeless shelters, nursing homes, or with a surprise flashmob! Are you planning a community event? We’d love to join in and add some music! Check out our Youtube page for videos of our previous performances. I was thrilled and delighted with the Voices of Harmony concert this June in Charlestown. The ensemble found a remarkable blend as a whole: Every group member seems to listen with such open sincere attention that they find a common sound every bit as rich as its parts. At the same time, individual members sang beautiful engaging solos that instantly drew us all into their magic. Along with the wonderfully diverse programming and the expressive dynamic of each number, what won my heart was when the performers took a break to invite everyone in the audience to turn and greet peole each other. Unexpectedly the bridge-building mission of Voices of Harmony belonged to all of us present in the hall. The smiles among everyone shaking hands and greeting each other were radiant. I venture to say that we all came away feeling a little more connected with all who had shared the pleasure of this beautiful concert. It was an honor to be a part of Eclectic Expressions, an event in support of a new vocal music program for teens and adults at the Roslindale Community Center. 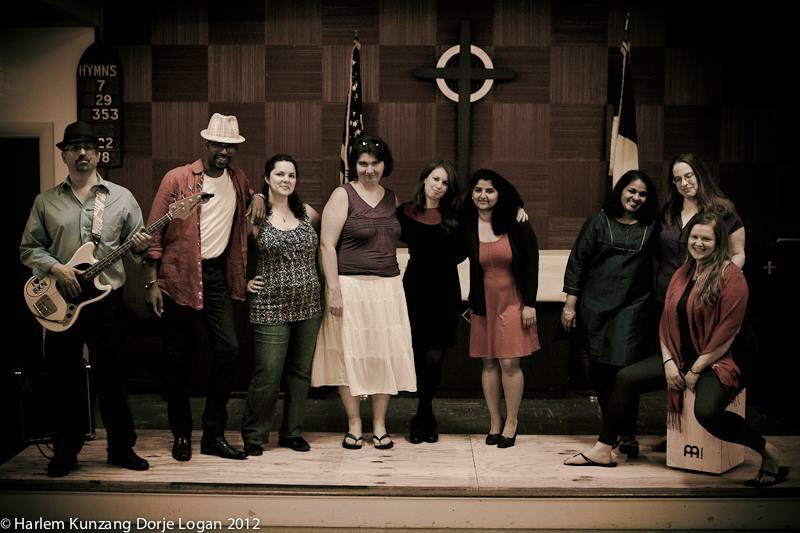 Voices of Harmony was in a line up alongside Americana-Urban-Cowgirl-Poetic-Songstress Lisa Marie Garver (VoH’s very own Music Director, backed by VoH members Micheal Hochlerin and Harlem Logan! ); and Zimbabwean Afro-Pop Singer-Songwriter Chashe (backed by an amazing band of players from Berklee College of Music). What a treat to partake in this celebration of diversity through vocal music in the culturally vibrant community of Roslindale! It is so much fun to be a part of the WUTE festival, with its parade, so many stages, arts and crafts, and kids’ activities. It was a pleasure to enjoy the energy of the festival and celebrate spring with our fans. What a fun afternoon at the Dorchester Farmer’s Market! 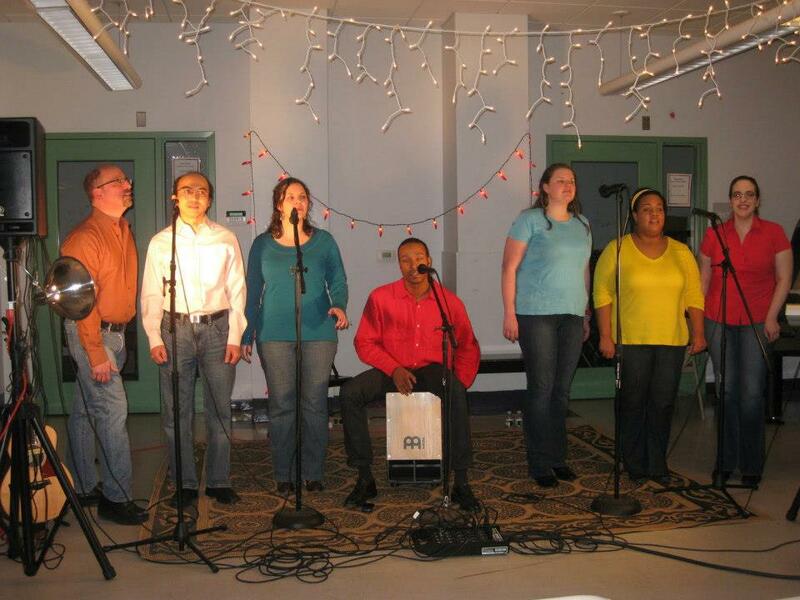 Amidst the hubbub of the vendors and consumers of delicious local food, Voices of Harmony performed for the community. We loved seeing all of you who crowded to the stage and danced along to our tunes. We had a truly inspirational time singing at Loaves and Fishes. The Meal Program serves about 250 people on Saturday nights – from homeless to elderly to working poor to neighbors who are struggling we feed anyone who is hungry. Thank you, Bill, for extending us the opportunity! Halloween this year was a series of impromptu performances. First we surprised riders of the Orange Line with our songs. (We even got some folks to sing along with us!) 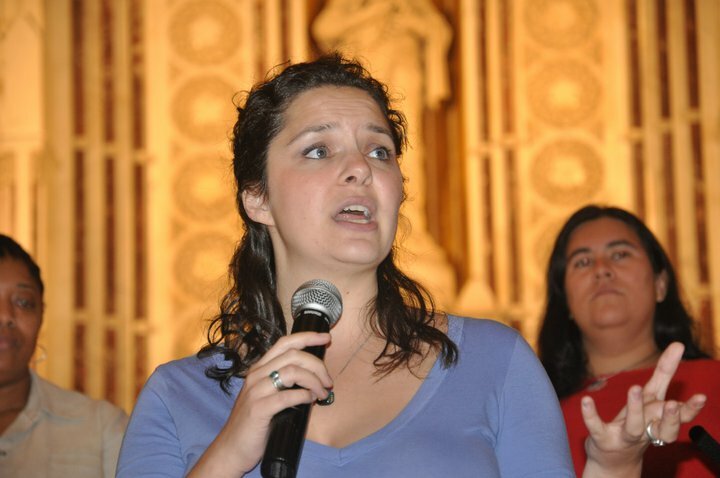 Then we headed to Occupy Boston to sing in the tent city. What fun! Spring Sing is our opportunity to perform our complete spring repertoire for our friends and family. 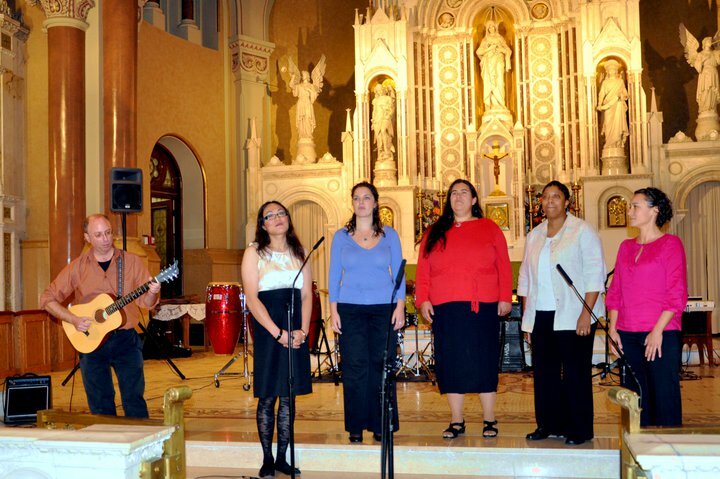 Audience members enjoyed the sounds of American folk, rock, and pop, African American gospel and spiritual music, Chilean Nueva Canción, Brazilian Tropicalismo, French jazz, and a South African hymn. 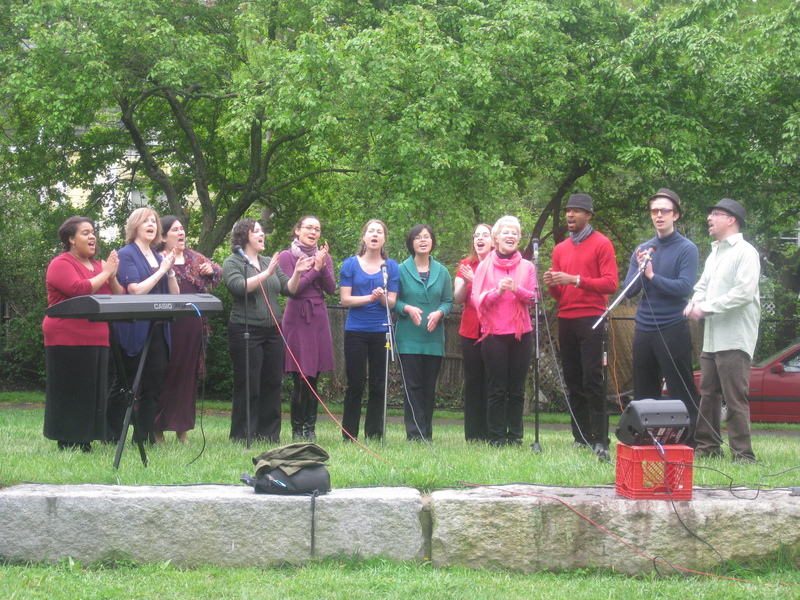 Voices of Harmony performed at the Popular Theatre Stage at the Wake Up the Earth festival this year. It was a great opportunity for our members to join in the celebration of spring with the community, and to sing most of our repertoire before our big Spring Sing later in the month. 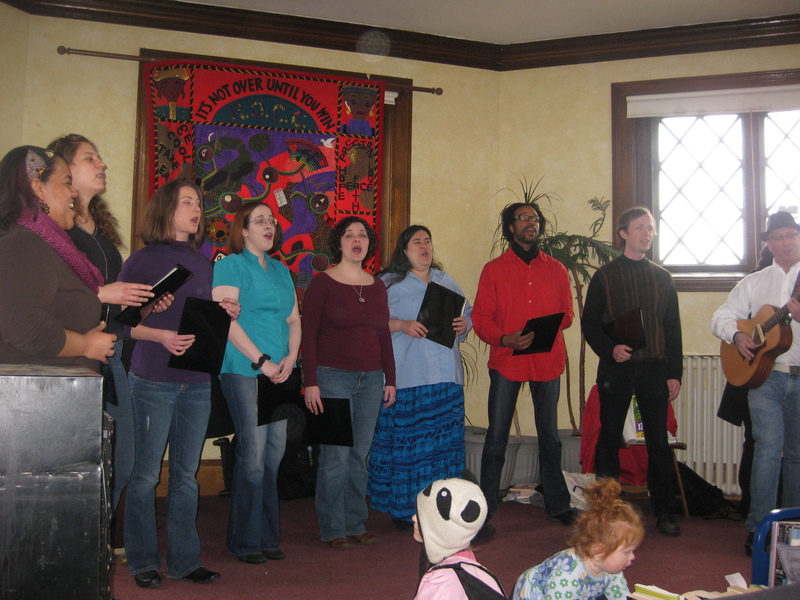 Voices of Harmony joined First Church’s Sunday service with songs from three holiday traditions: Chanukah – Mo’oz Tzur (Rock of Ages); Kwaanza – Seven Principles by Sweet Honey in the Rock; and Christmas – Joy to the World. This was a real community event, featuring: Voices of Harmony, Frank Wilkins & “We Jazz Up” (with special guest Stan Strickland), City Spotlights Mission Hill, Boston College, Voices of Imani Student Choir, Sociedad Latina Music Clubhouse Ensemble, RTH Golden Time Chorus, and The Asian-American Peace Quartet. For the finale of the show, all the groups came up on stage together to sing Love’s in Need of Love Today by the great Stevie Wonder. What a great way to raise funds for Mission Hill youth! Enter your email address to subscribe to Voices of Harmony's announcements and receive notifications of new posts by email.